My overal impression of the show is creative, effective and interesting. This is only the second year in recent years that I've been home to view it. Its a great showcase for Australian Quilting, but in saying that, there are quilts here from Korea and South Africa on exhibition. Expertise events do a wonderful job of bringing the best teachers from around the world and locally to teach new new techniques. globe it focuses on the challenge of the creation. Each state in Australia has their own quiltshow. The winners of those shows are entered in Best of Australia which will be announced this evening. 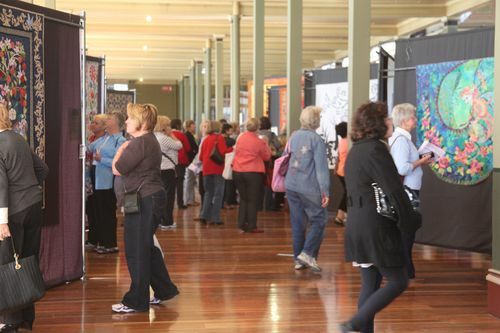 Somehow we have two South Australian quilters vying for the title this year. I won it one year for our State and its quite an honor.